A group of 21 personnel arranged in three rows. In front of the first row is a silhouetted model of a four engined bomber with '9' underneath. 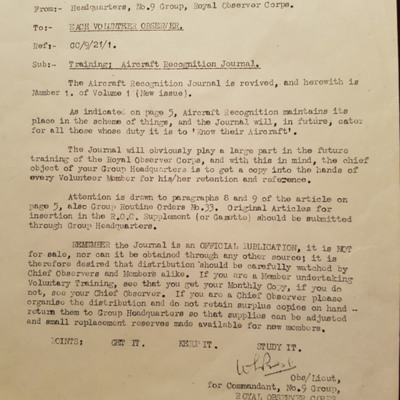 Introduces the revived Aircraft Recognition Journal, mentions its role in the future training of the Royal Observer Corps, and stresses its official nature. 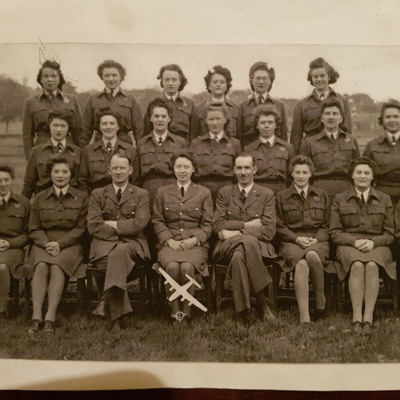 Iris McClements was a member of the Women’s Junior Air Corps and then the Royal Observer Corps. She met her husband on one of his visits to York.